Corner of Tonti Street in Uptown N.O. Note: Enter from Tonti St.
All classes include a rigorous warm-up focused on building strength, balance and stylization followed by upper body and footwork drills, turns, and combined exercises to improve fluidity of movement and coordination. The goal of our technique work is to improve execution while integrating a deeper understanding of flamenco compas (rhythms). November 3, 10, 17, 24. December 1, 8, 15. Start flamenco dance from scratch! This is the perfect opportunity for those who were always curious to learn about this mesmerizing and beautiful gitano-Andalusian art form but haven't had the opportunity to try it. Learn the basic elements of the art form while improving your balance, flexibility and strength in a comfortable setting- all while having fun! Note for Beginners: Flamenco or character dance shoes are best for class, but other sturdy, close-toed footwear will work (i.e. low, thick-heeled shoes or boots approx. 1.5 – 3in high) and comfy clothing to allow movement like stretch pants. Skirt is not required. 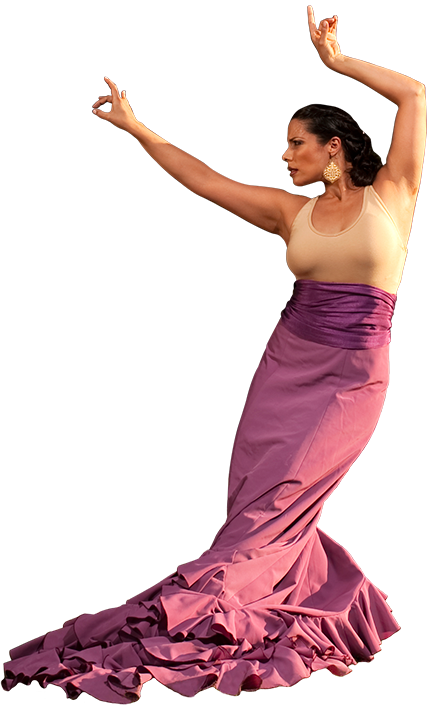 This class introduces students to flamenco dance structures, compas and cante. Choreography developed throughout the duration of the intensive. It is highly recommended to attend all classes. We have a very special treat this session for this class: it will be led by both Eliza and guitarist Gaspar Rodriguez, our visiting artist from Spain! Students will delve deeper into their study of flamenco dance structures, compas and cante. In this special extended 75min class, students will have the rare experience of working directly with this acclaimed artist to further their understanding of the true language of Flamenco. We will explore concepts of communication between dancer and musicians, interpretation of the cante and choreographic sequences, and aspects of accompaniment. Choreography developed throughout the duration of the intensive. It is highly recommended to attend all classes. except the 75 min. Intermediate Choreography class on Saturdays which is $25.